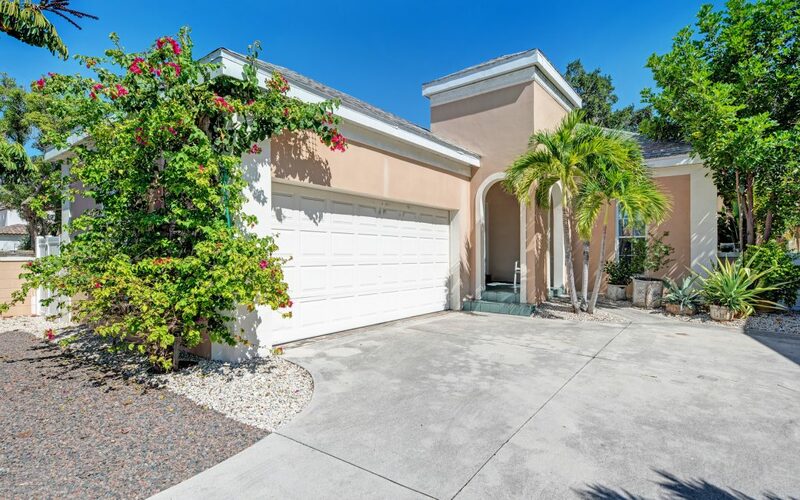 Welcome to this 3 bedroom West of the Trial home, ideally located near Siesta Key Beach, Cinebistro, Westfield mall, the Hillview area which features Morton’s Gourmet Market, great neighborhood restaurants within biking distance, Sarasota Memorial Hospital, and all that downtown Sarasota has to offer! Located in the highly sought after Southside school district, this affordable home is the perfect primary home, or great investment. This single story home has a coastal Mediterranean feel, vinyl fence for ultimate backyard privacy and almost zero maintenance landscaping. The living-dining room area boasts cathedral ceilings and the glass sliders that provide ample natural light and great view of the lovely paved patio in the backyard, which is perfect for enjoying the Florida weather. Step in to the master bedroom, with slider access to the patio area, and ensuite bathroom featuring separate tub and shower. Kitchen updated with Corian countertops and light cabinetry. The second and third bedrooms are both large and offer plenty of closet space. Don’t miss this opportunity to own close to Siesta Key!